The magnificent slab that forms the top of this desk has a significant crack but it would not break, even when subjected to extreme stress. 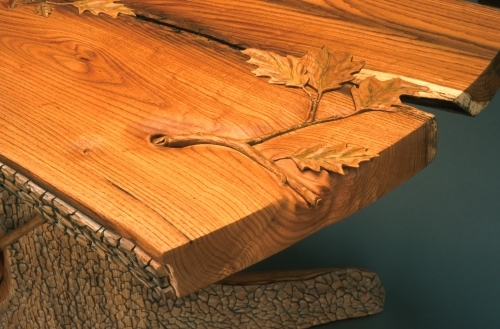 Inspired by the board, Kurt invested months of labor to pay appropriate tribute to this lovely red oak. 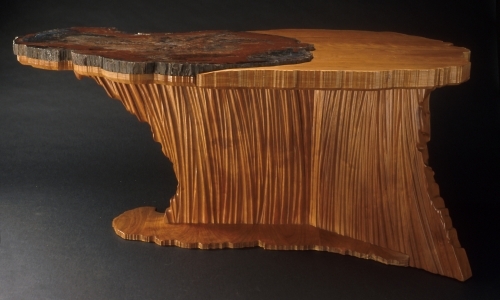 The staved oak base, textured to resemble bark, covers a steel frame to support the massive desk top. This slab is the sister board to the original Tanglewood Desk show above. 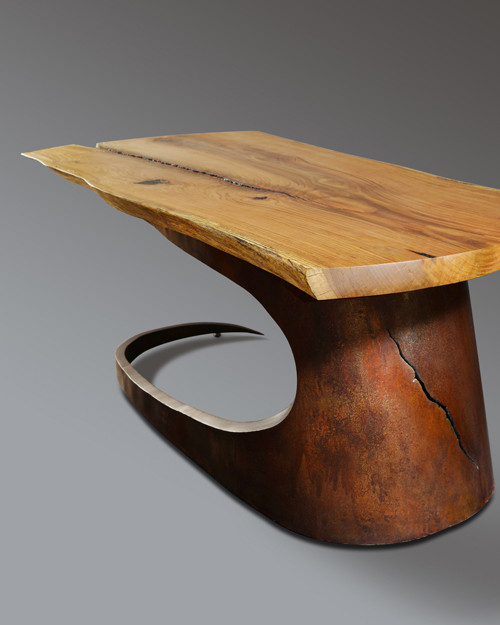 Cantilevered on a custom steel base with a lovely patina and texture, it illustrates the range of possibilities with similar materials as a starting point. 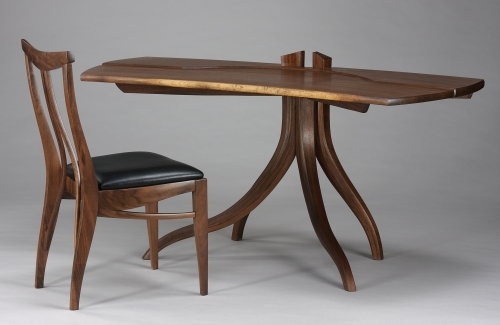 The Aspen Desk was initially created for an entrepreneur in Colorado. 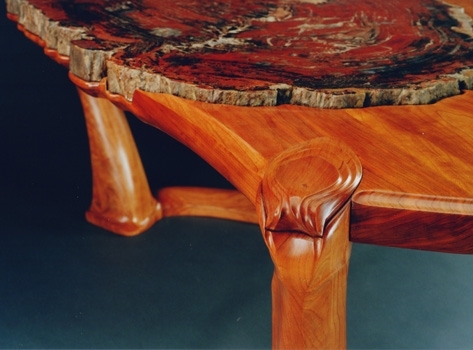 It was crafted in cherry with a sculpted base and features a writing surface of pertified wood from the southwestern United States. 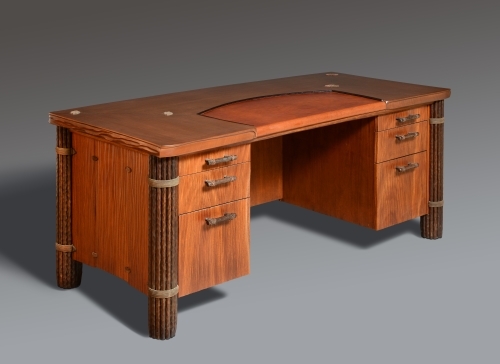 This desk offers a wide range of textures and materials- cherry top, side and drawer panels, wenge leg and drawer pulls, wrapped and accented with leather windings with a custom leather writing and work surface. 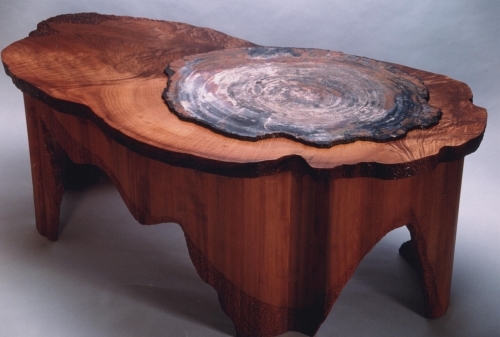 Kurt first used petrified wood as a desk blotter almost 15 years ago on the desk in this home office. Harder than granite, petrified wood is a wonderful surface for a desk blotter, almost impermeable and resistant to scratching. Leaving the stone proud of the surface is a hallmark of Kurt’s work, retaining the sense of the mass of the slab, as is the custom fitting of the piece into the desk surface. Two of these desks serve as the registration desks at the El Monte Sagrado resort in Taos, New Mexico. 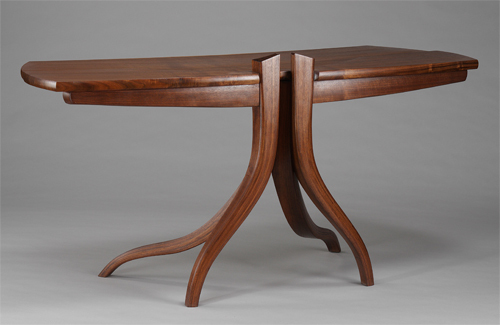 The Melbourne Desk in cherry has graceful curving lines and an organic feel. 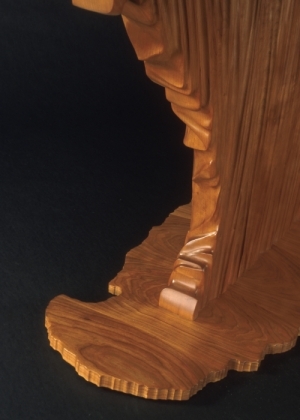 The executive desk chair has applied carved arms, echoing the lines of the desk. 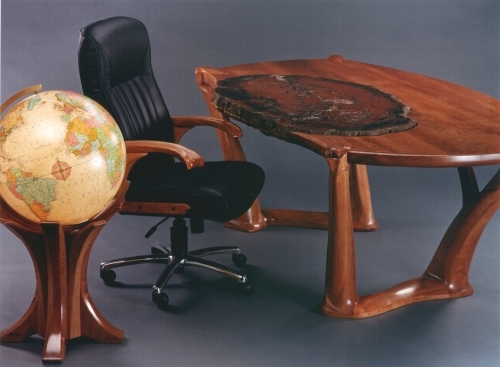 The globe base was created as a companion piece but is also available as an independent unit. 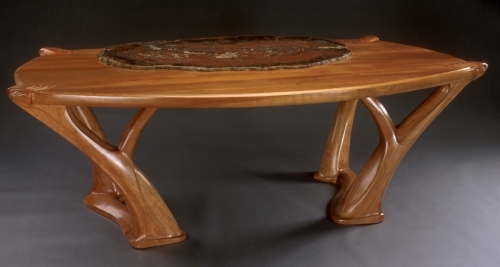 Jere Osgood, the New Hampshire Furniture Master and fellow of the American Crafts Council, was Kurt’s first teacher at the Boston University Program in Artisanry in 1978. 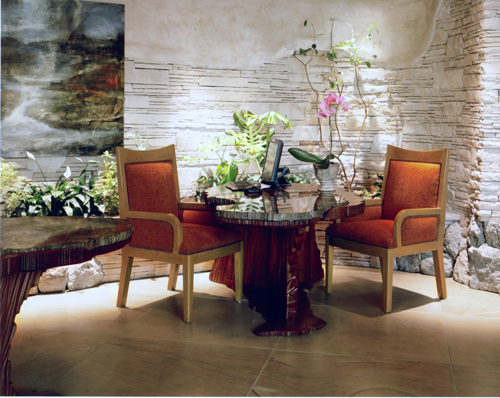 Kurt renewed contact and purchased a chair from Jere, appreciating the lines of the chair and its simple beauty. 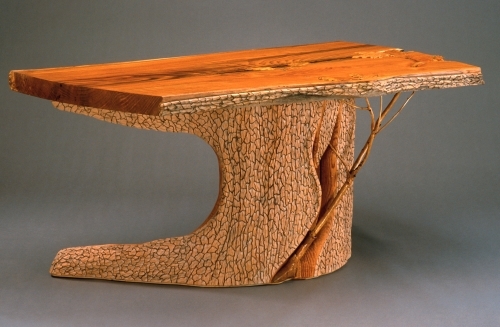 When the opportunity presented itself to attend Jere’s workshop at Peter’s Valley Craft Center, he designed and built this desk as a companion for the chair. 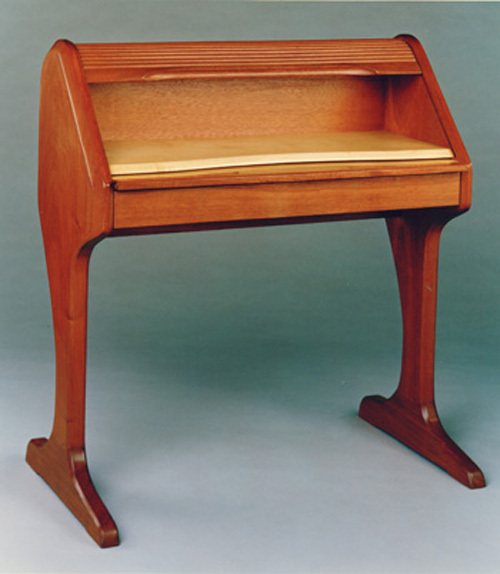 It stands as a tribute to this wonderful furniture maker- a principal role model and source of inspiration. 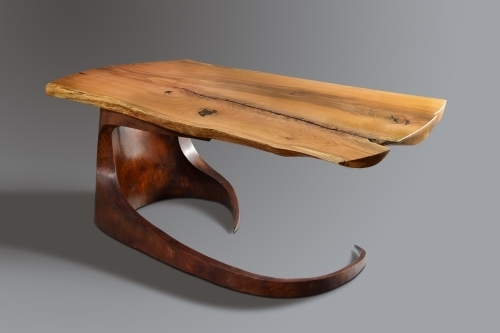 Kurts first desk was this roll-topped mahogony and maple contemporary piece. 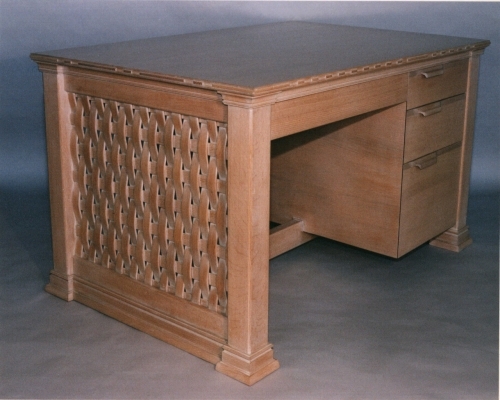 This two-sided desk of oak was built for a couple who run a business from their home and it allows use for two people, one on each side. The top is larger than it appears, 80” in width and 42” in depth. 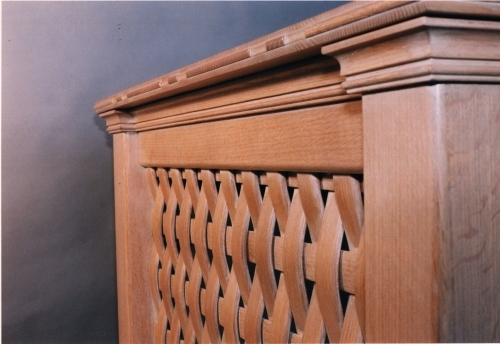 Note the “woven” details and carving on the edges that make it such a unique piece. 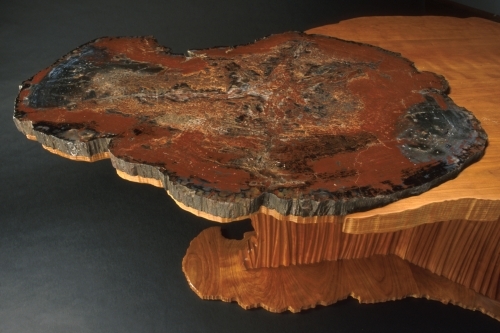 Another spectacular specimen of petrified wood is featured in this desk, crafted for presentation at the Tucson Gem & Mineral Show, the 2nd largest such show in the world. 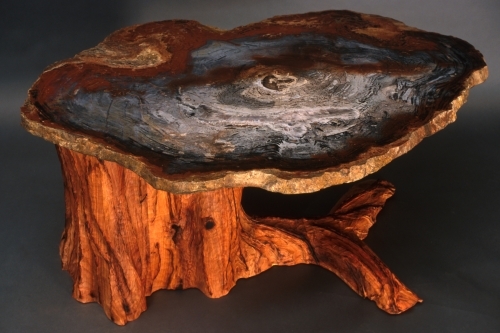 The base is of Mesquite, shaped to represent a natural tree base.